Background: Significant increase in cell proliferation and vascularity occurs during the transition from normal oral mucosa through differing degrees of dysplasia to oral squamous cell carcinoma (OSCC). Aims: To evaluate the cell proliferation and vascularity in potentially malignant disorders and OSCC. 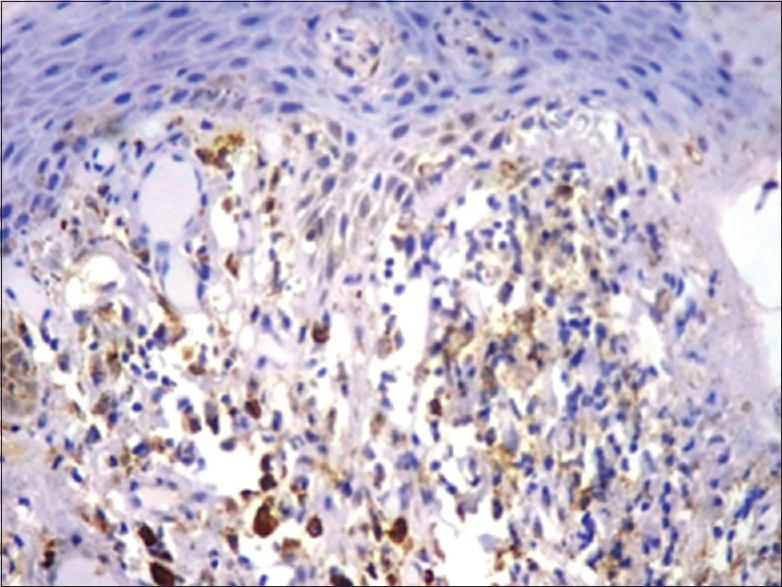 Settings and Design: Proliferating cell nuclear antigen (PCNA), vascular endothelial growth factor (VEGF) and CD34 were quantified immunohistochemically (IHC) using anti-PCNA, anti-VEGF and anti-CD34 antibody. Materials and Methods: A total of 60 archival specimens included 10 oral lichen planus, 10 oral leukoplakia, 10 oral submucous fibrosis and 30 OSCC (well differentiated, moderately differentiated and poorly differentiated), and also, 10 normal oral mucosa as control group were taken. 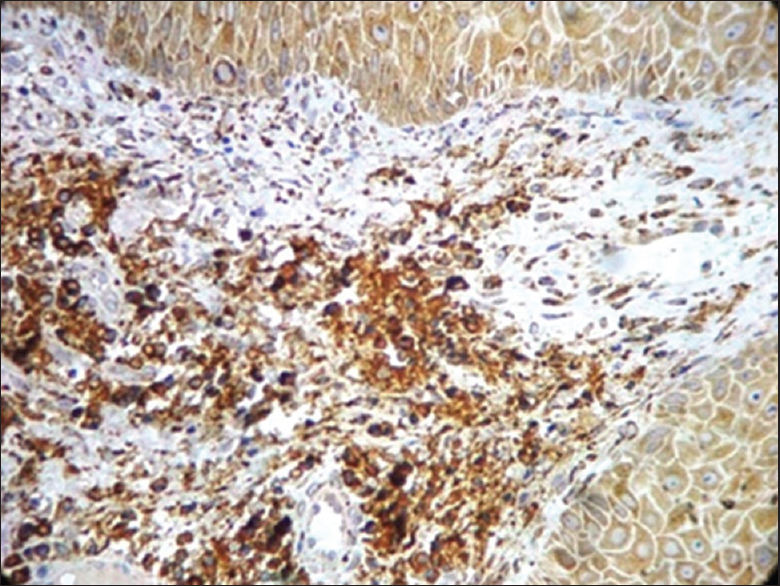 PCNA, VEGF and CD34 expression was assessed in relation to the localization and area of IHC-stained cells. Statistical Analysis: One-way analysis of variance test and post hoc least significant difference test were assessed for statistical significance. 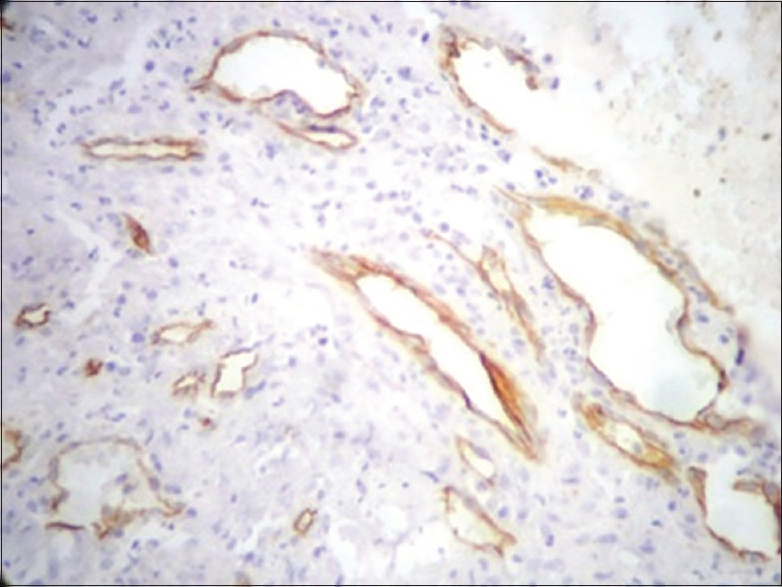 Results: Cell proliferation and vascularity appeared to increase gradually with disease progression. Conclusion: Upregulation of cell proliferation and vascularity indicates their possible role in malignant transformation of potentially malignant disorders. The information obtained in the clinical and histopathological examinations is not always satisfactory for the diagnosis and prognosis of potentially malignant disorders. Therefore, more specific methods are used to allow the measurement of the cellular alterations by means of cellular and tissue markers. Several markers have been used to provide additional information about malignant transformation in potentially malignant disorders, including angiogenesis and cell proliferation markers, which have long been used in the study of cancer and are the focused of this study. At present, angiogenesis is considered an essential process in tumor development. Angiogenesis, the formation of new blood vessels, is crucial to the growth, invasion and metastasis of a tumor. Tumor angiogenesis, like the physiological one, is the process of creating new blood vessels starting from the already existing ones, either by recruiting precursor endothelial cells or by multiplying the endothelial cells of the already existing capillaries. Cell proliferation is a biological process vitally important to all living organisms due to its role in the growth and maintenance of tissue homeostasis. The control of this important process is completely dysregulated in cancer, and the assessment of cell proliferation activity in tumors has become a common tool used by histopathologists to provide useful information for diagnosis, clinical behavior and therapy. 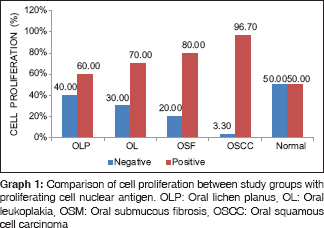 The present study has been proposed to assess some aspects of the angiogenesis and cell proliferation processes based on vascular endothelial growth factor (VEGF), CD34 and proliferating cell nuclear antigen (PCNA) expression in oral lichenplanus (OLP), oral leukoplakia (OL), oral submucous fibrosis (OSF) and oral squamous carcinoma (OSCC). Sixty formalin-fixed paraffin-embedded archival biopsies of 10 OLP (GroupI), 10 OL (GroupII), 10 OSF (GroupIII) and 30 OSCC (10 well-differentiated SCC[WSCC], 10 moderatelydifferentiated SCC [MSCC] and 10 poorlydifferentiatedSCC [PSCC] [GroupIV]) were obtained from the Department of Oral Pathology and Microbiology, Kamineni Institute of Dental Sciences, Narketpally. Ten cases of normal control group (Group V) were also included. 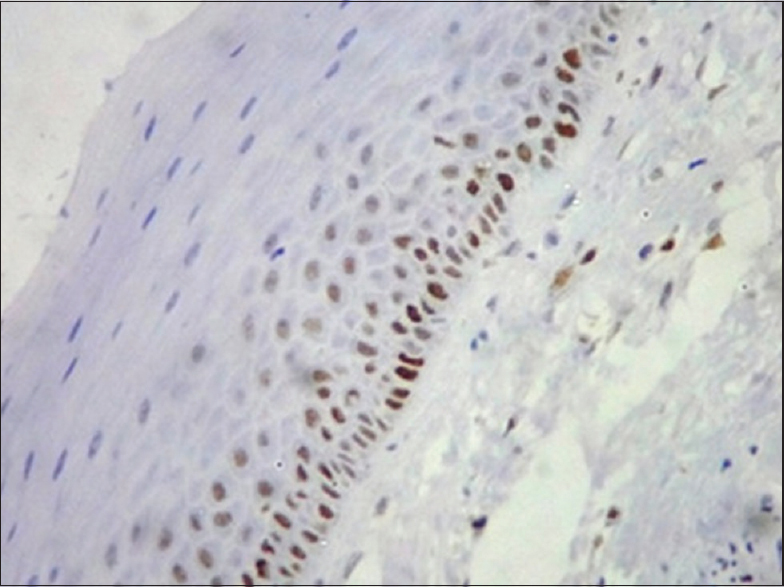 All tissue biopsies were sectioned at 3μm thickness and taken onto a poly-L-lysine-coated glass slide, and further, immunohistochemistry (IHC) procedure was performed to detect VEGF, CD34 and PCNA expression. Sections were deparaffinized followed by rehydration and antigen retrieval was carried out. Thereby, sections were incubated with peroxidase block to block the endogenous peroxidase activity which was followed by protein block, primary antibody, post primary antibody, polymer and substrate chromogen application and finally counterstained with Mayer's hematoxylin and mounted. 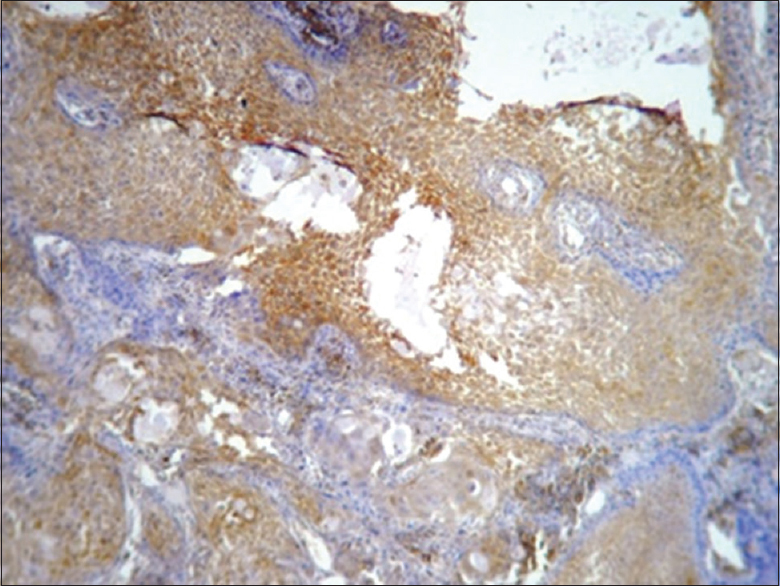 Staining was performed as per the IHC staining protocol. 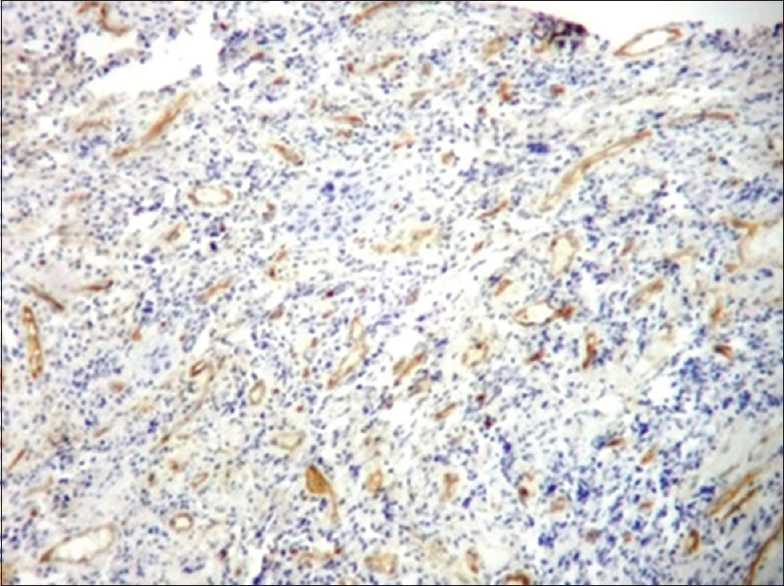 The presence of brown-colored end product at the site of target antigen was indicative of positive immunoreactivity. 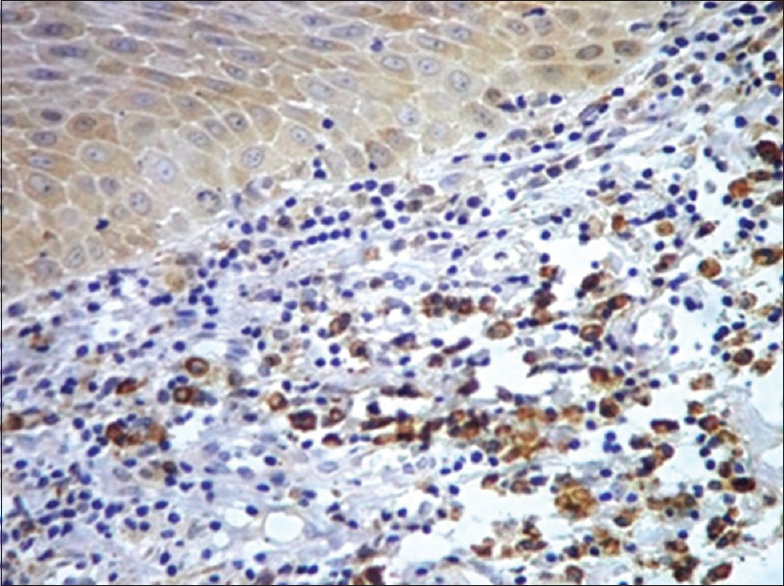 PCNA expression was evaluated on the basis of number of positively stained cell; expression of PCNA was designated as positive (>5% of cells were stained) and negative (<5% of cells stained). Three high-power fields (×40) were selected from the stained sections to determine the stained cells per 100 counted cells in the basal and parabasal layers as positive and negative. 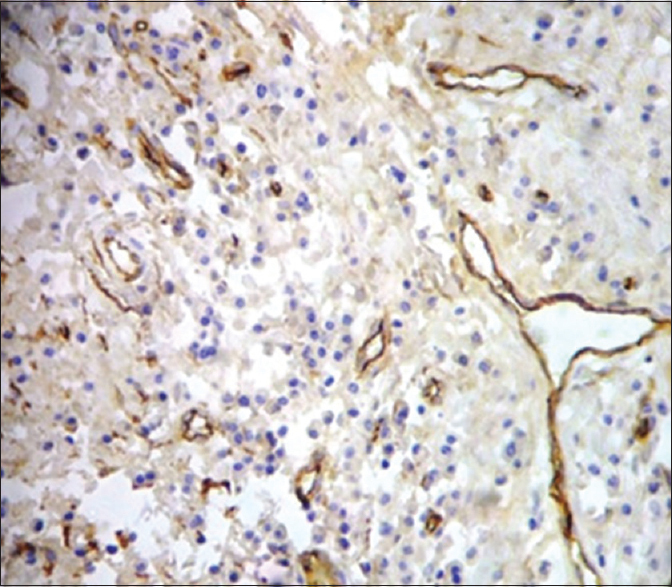 VEGF expression was quantified according to the area of staining in the connective tissue under low-power view (×10). 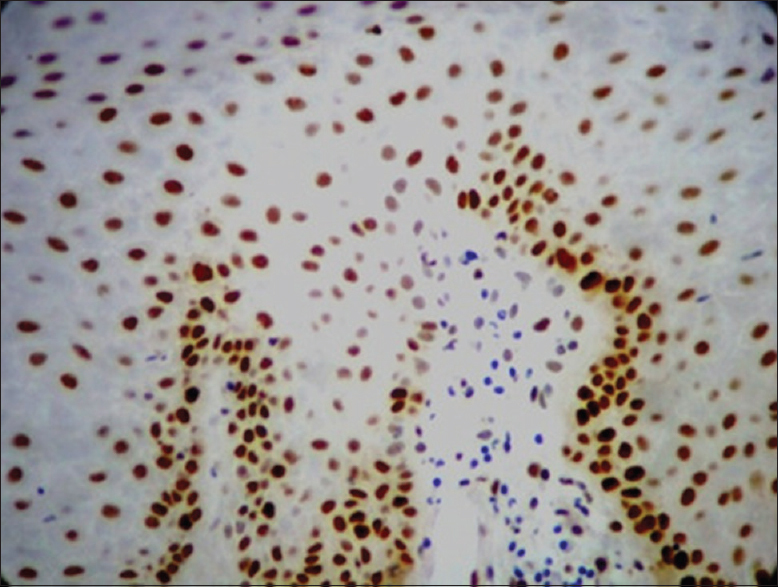 The area of staining was scored as 0, no stained cells in any microscopic field, 1, <25% of tumor cells stained positively, 2, 25-50% of tumor cells stained positively, 3, 50-75% of tumor cells stained positively and 4, >75% of tumor cells stained. 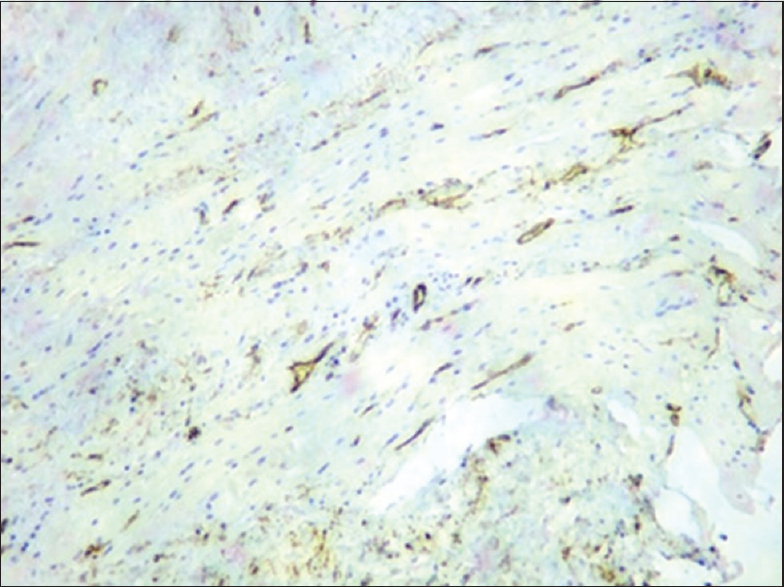 CD34 expression was assessed as microvessel density, and the assessment was carried out at the level of endothelial cells lining the blood vessels by their brown cytoplasmic staining in the connective tissue. Microvessel density in areas showing the highest density of staining determined by low-power view (×10) was selected, and then, under three high-power view (×40), the number of CD34-positive endothelial lined blood vessels was counted. SPSS (Statistical package for social sciences) is a software package used for statistical analysis. IBM SPSS Statistics for Windows, Version 22.0. (Armonk, NY: IBM Corp). The significance of the results obtained from the control and study group was statistically analyzed by Chi-squared test and one-way analysis of variance (ANOVA) test, and multiple comparisons between the groups were assessed for statistical significance using post hoc least significance difference (LSD) test. The cell proliferation determined by PCNA expression was based on nuclear staining per 100 counted cells in the basal and parabasal layer when viewed under three high-power views (×40) [Figure 1], [Figure 2], [Figure 3], [Figure 4], [Figure 5], [Figure 6], [Figure 7]. Based on the Chi-squared test among the study groups, normal group showed only 50% expression of PCNA, whereas OLP and OL groups showed 60% and 70% expression, respectively, while OSF showed 80% and OSCC showed majority (96.7%) expression. This difference in the expression was statistically significant (P = 0.035) [Table 1] and [Table 2], [Graph 1]. 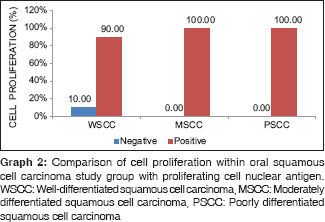 The positivity for expression of PCNA in WSCC, MSCC and PSCC was 90%, 100% and 100%, respectively. Within the OSCC group, PCNA expression determined using Chi-squared test showed no statistical significance (P = 0.355) [Table 3] and [Table 4], [Graph 2]. 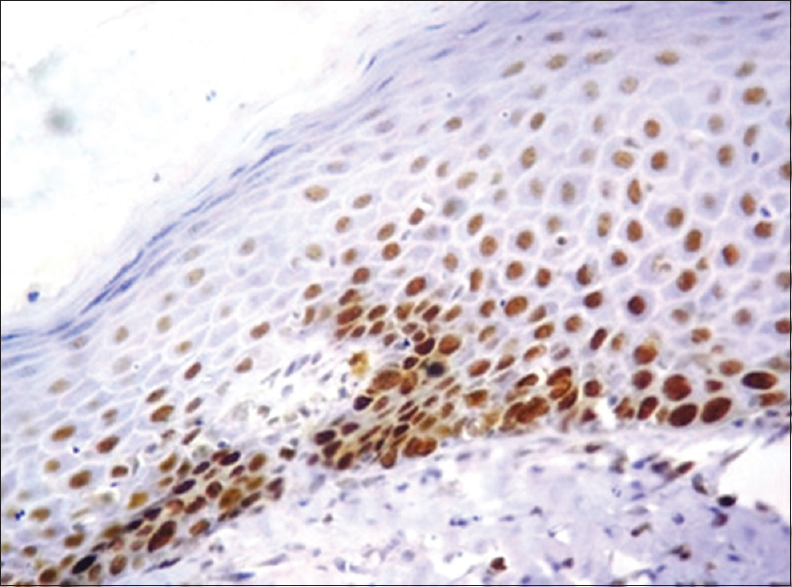 VEGF expression was confirmed by the presence of brown-stained cytoplasm in the connective tissue when viewed under low-power view (×10) [Figure 8], [Figure 9], [Figure 10], [Figure 11], [Figure 12], [Figure 13], [Figure 14], [Figure 15]. The data assessed for significance between the groups using one-way ANOVA showed statistical significance (P = 0.000). Multiparametric post hoc LSD test was done between the study groups, and there was a statistical significance between the groups, but the results were not statistically significant (P = 0.068) between OL and normal oral mucosa group [Table 5], [Table 6], [Table 7]. The data assessed for significance within the OSCC using one-way ANOVA and multiparametric post hoc LSD test showed statistical significance [Table 8], [Table 9], [Table 10], [Graph 3] and [Graph 4]. Microvessel density was based on the CD34-positive endothelial cells lining the blood vessel in the connective tissue; at first, three microscopic fields of highest neovascularization under low-power view (×10) were selected and then counted under high-power view (×40) [Figure 16], [Figure 17], [Figure 18], [Figure 19], [Figure 20], [Figure 21]. One-way ANOVA was performed for significance between the groups and P = 0.000 was considered statistically significant. Multiparametric post hoc LSD test done between the study groups also was statistically significant [Table 11], [Table 12], [Table 13]. The data assessed for significance within the OSCC using one-way ANOVA and multiparametric post hoc LSD test showed statistical significance [[Table 14], [Table 15], [Table 16], [Graph 5] and [Graph 6]. Previous studies ,,,,,,,,,,,,,,,,,, included most but not all the parameters as in the present study, providing evidence of variation in anti-VEGF, anti-CD34 and anti-PCNA antibody staining. However, few studies ,,,,,,,,,, have not shown statistically significant results among the parameters considered. A probable explanation could be that changes in the proliferative capacity may be an early consequence of carcinogen exposure and simultaneous field cancerization, a phenomenon that could occur before the appearance of morphologically apparent hyperplasia or dysplasia. It is generally accepted that increased proliferation is associated with more advanced lesions and that the distribution of proliferating cells in tissue may tell us more about the regulatory mechanism that becomes dysfunctional during the multi step process of carcinogenesis. Along with cell proliferation, at present, angiogenesis is considered an essential process in oral cancer development. Significance of angiogenesisis because the exact quantification of tumor vessels is useful for assessing the lesion prognosis and metastasization ability. In OLP, an increase in proliferation might be related to there lease of cytokines and inflammatory mediators from injured keratinocytes or inflammatory cells following immunological reactions. This increase may result in a suitable ground for malignant transformation. As an autoimmune disease with inflammatory origin and chronic progression, OLP satisfies all the prerequisites of hypoxia which is essential for angiogenesis. If angiogenesis is increased, it leads to more recruitment and retention of lymphocytes or inflammatory infiltrate or progression of disease or recurrence of lesions. Inflammatory infiltrates in turn can progress to carcinogenesis. In OL, accumulation of mutations in growth regulatory genes may result in an increased proliferative activity. As cells transform from normal to dysplastic, the balance between proangiogenic and antiangiogenic factors is altered and the dysplastic epithelial cells themselves acquire transient angiogenic properties. Thereby, shifting to angiogenic phenotype occurs as early as mild dysplasia. As appearance of OSCC is gradually preceded by epithelial dysplasia, a gradual increase of VEGF in OL is considered to satisfy the criteria of a potentially malignant disorder progressing into a malignancy. In OSF, the increased cell proliferation could be induced by direct stimulation from the mitogen-like compounds contained in areca quid or by there generative proliferation after cell death. Secondly, as PCNA is associated with DNA excision repair, PCNA expression may also increase after DNA damage is induced by areca quid components. As the stroma becomes more and more hyalinized due to progressive deposition and cross-linkage of mature collagen bundles, the tissue suffers resultant ischemia/hypoxia due to physical and biochemical effects of the process. 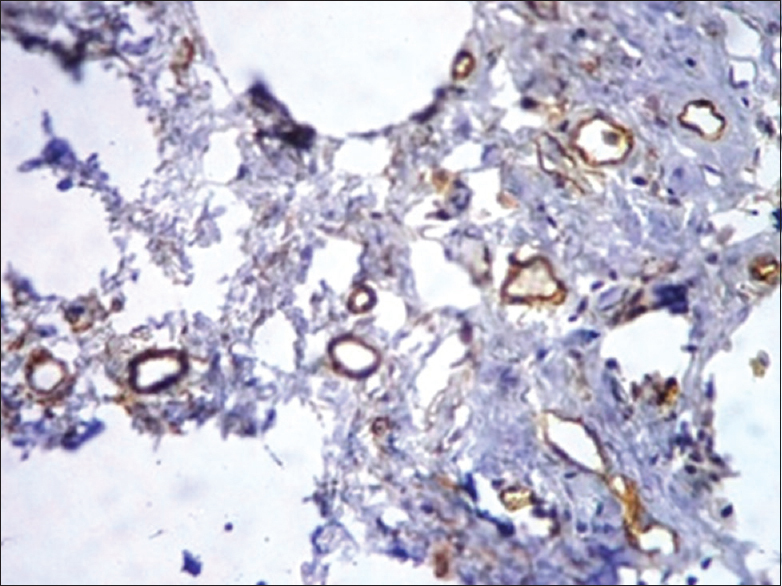 Pursuing further the pathological mechanism, the tissue tries to cope up with hypoxia by actively promoting neovascularization as an adaptive response on the part of the mucosa in survival of the atrophic epithelium. In OSCC, the correlation between PCNA and cell proliferation is probably because of the PCNA involvement in DNA repair which is active and ongoing function so that it might be upregulated in nonproliferating cells. The increase in VEGF expression within the OSCC group supports the idea that VEGF is involved in increasing vascularity with disease progression. This could be supported by the fact that VEGF secreted by tumor cells does not stimulate growth directly but leads to increased growth and permeability of endothelial cells, and as vascular permeability increases, microvessels in tumor environment may become leaky, thereby making them more penetrable by tumor cells. Cell proliferation and angiogenesis can be considered a paramount for the assessment of the behavior of potentially malignant disorder. Infact, the malignant transformation of a potentially malignant disorder can be predicted based on cell proliferation rate and degree of vascularity. In turn, therapies that focus on targeting various molecules and pathways involved in cell proliferation and vascularity may provide better control of the progression of potentially malignant disorders to malignancies. Kamineni Institute of Dental Sciences supported the study. Moraes de M, Maia CA, Freitas de RA, Galvao HC. 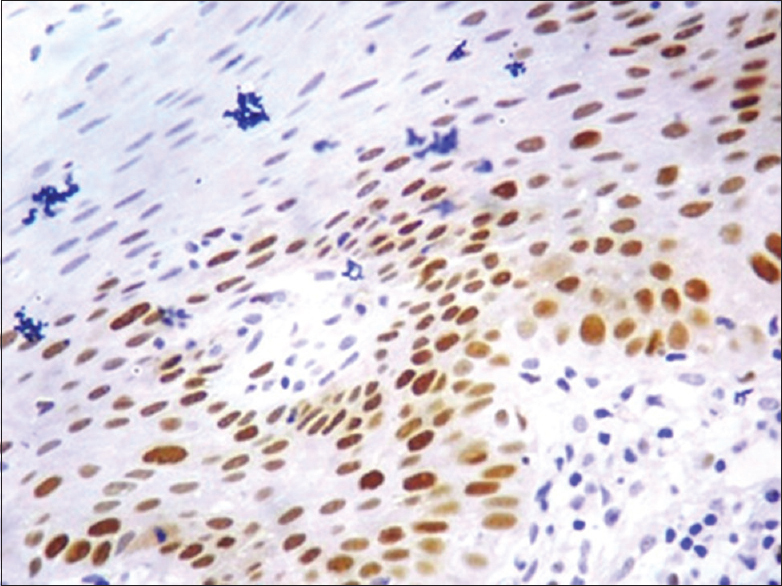 Cell proliferation markers in oral squamous cell carcinoma. J Mol Biomark Diagn 2012;8:1-5. Johnstone S, Logan RM. 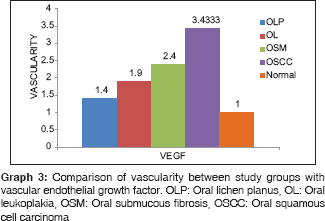 Expression of vascular endothelial growth factor (VEGF) in normal oral mucosa, oral dysplasia and oral squamous cell carcinoma. Int J Oral Maxillofac Surg 2007;36:263-6. Bunget A, Fronie A, Afrem E, Corlan Puşcu D, Manolea H, Dan AR, et al. Microscopic aspects of angiogenesis and lymphangiogenesis in oral squamous cell carcinoma. Rom J Morphol Embryol 2013;54:623-7. Carlile J, Harada K, Baillie R, Macluskey M, Chisholm DM, Ogden GR, et al. Vascular endothelial growth factor (VEGF) expression in oral tissues: Possible relevance to angiogenesis, tumour progression and field cancerisation. J Oral Pathol Med 2001;30:449-57. Shieh YS, Lee HS, Shiah SG, Chu YW, Wu CW, Chang LC, et al. Role of angiogenic and non-angiogenic mechanisms in oral squamous cell carcinoma: Correlation with histologic differentiation and tumor progression. J Oral Pathol Med 2004;33:601-6. Li C, Shintani S, Terakado N, Klosek SK, Ishikawa T, Nakashiro K, et al. 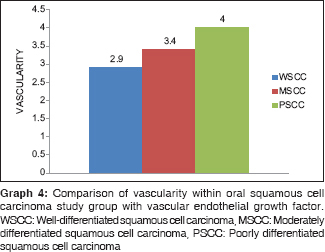 Microvessel density and expression of vascular endothelial growth factor, basic fibroblast growth factor, and platelet-derived endothelial growth factor in oral squamous cell carcinomas. Int J Oral Maxillofac Surg 2005;34:559-65. Mărgăritescu C, Pirici D, Stîngă A, Simionescu C, Raica M, Mogoantă L, et al. 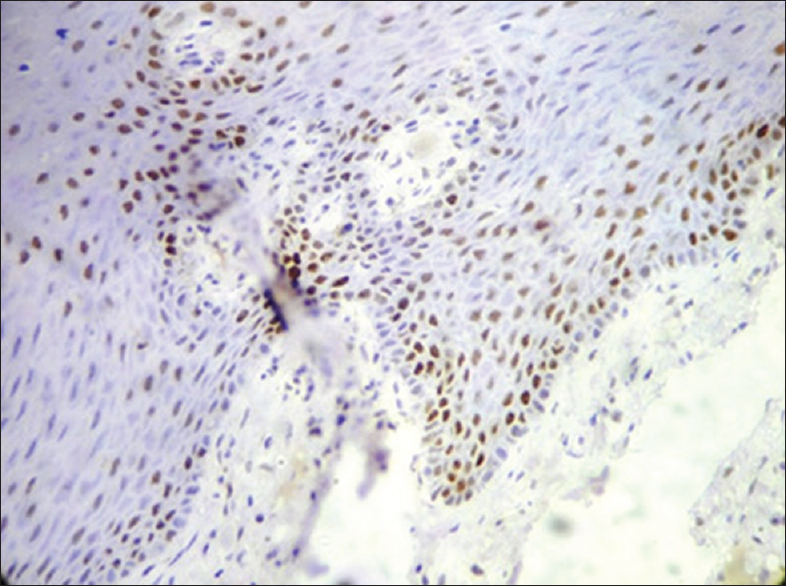 VEGF expression and angiogenesis in oral squamous cell carcinoma: An immunohistochemical and morphometric study. Clin Exp Med 2010;10:209-14. Mukherjee S, Ray JG, Chaudhuri K. Microscopic analysis of histological and immunohistochemical sections to differentiate normal, precancer and cancerous oral squamous epithelial tissues. Formatex 2010. Mittal N, Shankari GM, Palaskar S. Role of angiogenesis in the pathogenesis of oral lichen planus. J Oral Maxillofac Pathol 2012;16:45-8. Astekar M, Joshi A, Ramesh G, Metgud R. Expression of vascular endothelial growth factor and microvessel density in oral tumorigenesis. J Oral Maxillofac Pathol 2012;16:22-6. 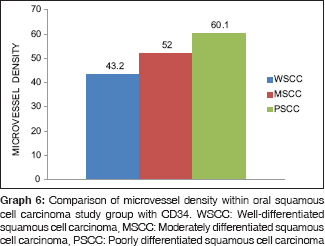 Torabinia N, Razavi SM, Tahririan D. Vascular endothelial growth factor (VEGF) expression in normal, dysplastic and neoplastic squamous epithelium of oral mucosa. J Pioneer Med Sci 2014;4:115-8. Varma S, Shameena PM, Sivasankaran S, Manoj Kumar KP, Varekar AA. Vascular endothelial growth factor expression in oral epithelial dysplasia and oral squamous cell carcinoma. Oral Maxillofac Pathol J 2014;5:423-8. Kobayashi I, Matsuo K, Ozeki S, Ohishi M, Ishibashi Y, Sakai H, et al. The proliferative activity in oral epithelial dysplasia analyzed by proliferating cell nuclear antigen immunostaining and argyrophilic nucleolar organizer region staining. Hum Pathol 1995;26:907-13. Staibano S, Mignogna MD, Lo Muzio L, Di Alberti L, Di Natale E, Lucariello A, et al. 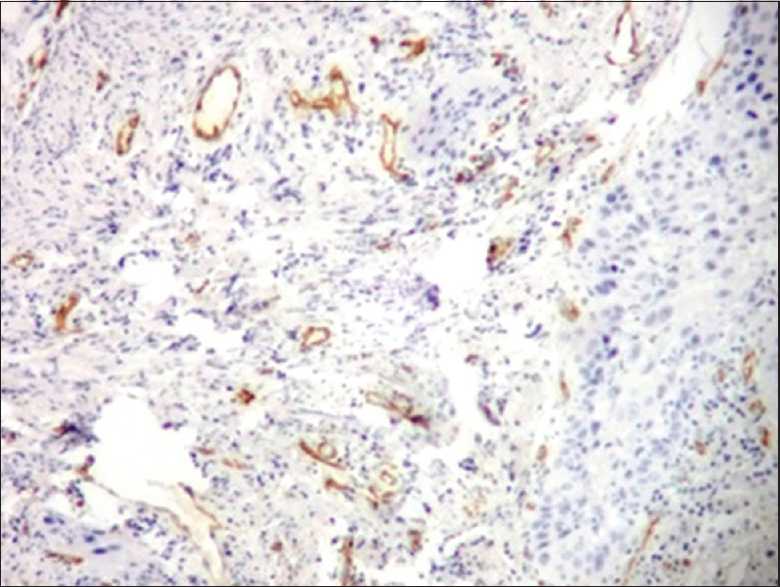 Overexpression of cyclin-D1, bcl-2, and bax proteins, proliferating cell nuclear antigen (PCNA), and DNA-ploidy in squamous cell carcinoma of the oral cavity. Hum Pathol 1998;29:1189-94. Chiang CP, Lang MJ, Liu BY, Wang JT, Leu JS, Hahn LJ, et al. 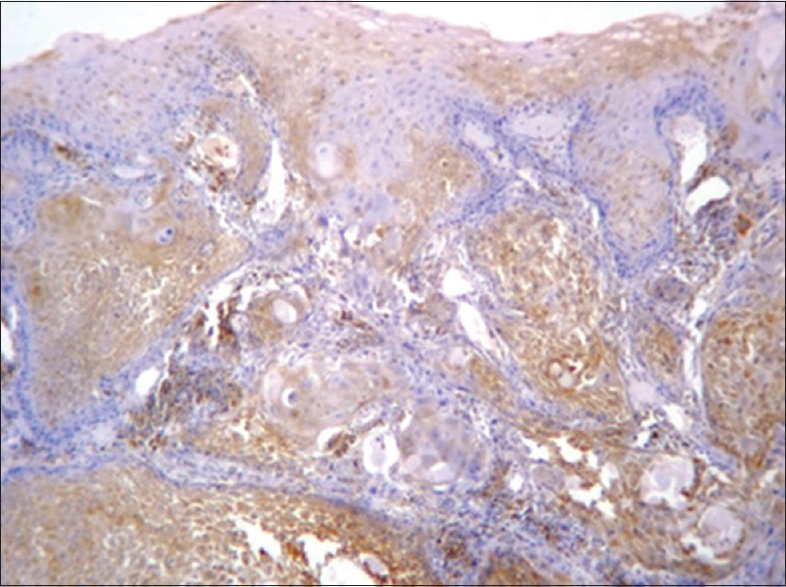 Expression of proliferating cell nuclear antigen (PCNA) in oral submucous fibrosis, oral epithelial hyperkeratosis and oral epithelial dysplasia in Taiwan. Oral Oncol 2000;36:353-9.
da Silva Fonseca LM, do Carmo MA. Identification of the AgNORs, PCNA and Ck16 proteins in oral lichen planus lesions. Oral Dis 2001;7:344-8. Srinivasan M, Jewell SD. 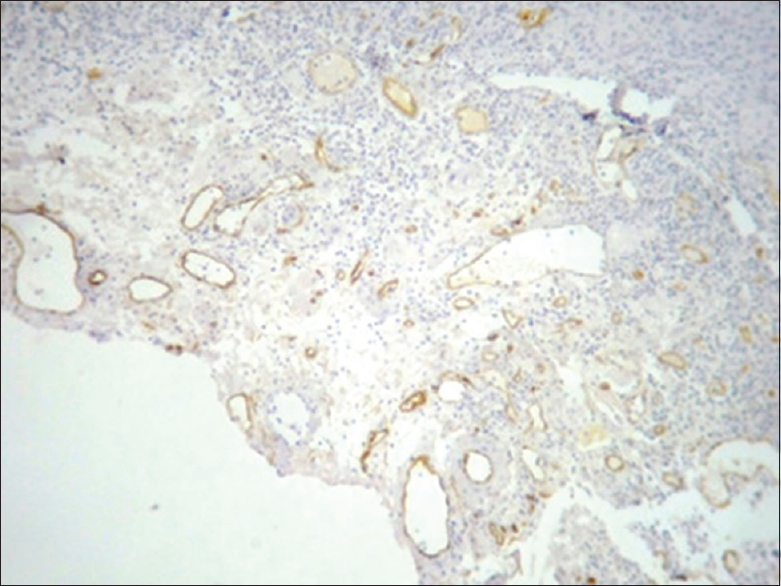 Quantitative estimation of PCNA, c-myc, EGFR and TGF-alpha in oral submucous fibrosis – An immunohistochemical study. Oral Oncol 2001;37:461-7. Lee JJ, Kuo MY, Cheng SJ, Chiang CP, Jeng JH, Chang HH, et al. 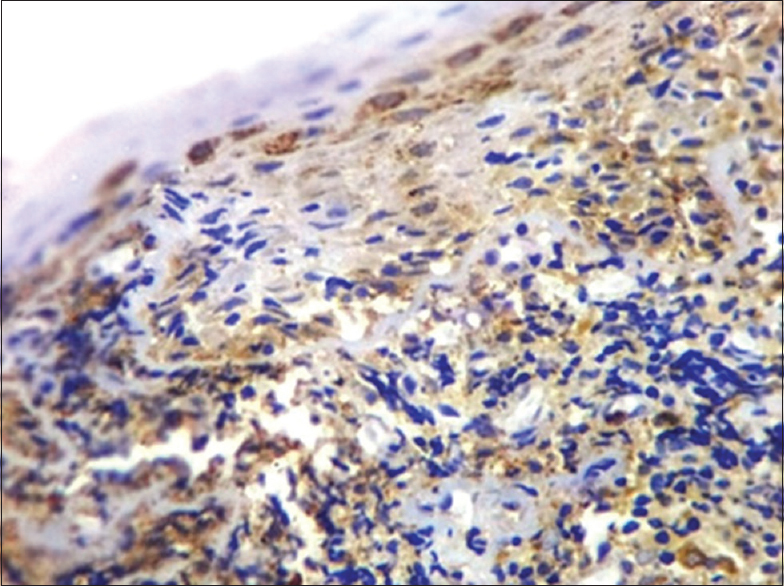 Higher expressions of p53 and proliferating cell nuclear antigen (PCNA) in atrophic oral lichen planus and patients with areca quid chewing. Oral Surg Oral Med Oral Pathol Oral Radiol Endod 2005;99:471-8.
de Sousa FA, Paradella TC, Carvalho YR, Rosa LE. 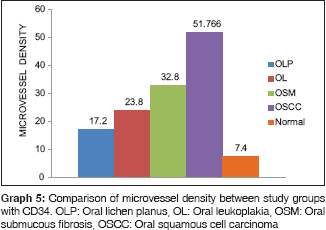 Comparative analysis of cell proliferation ratio in oral lichen planus, epithelial dysplasia and oral squamous cell carcinoma. Med Oral Patol Oral Cir Bucal 2009;14:e563-7. Sousa FA, Paradella TC, Carvalho YR, Rosa LE. 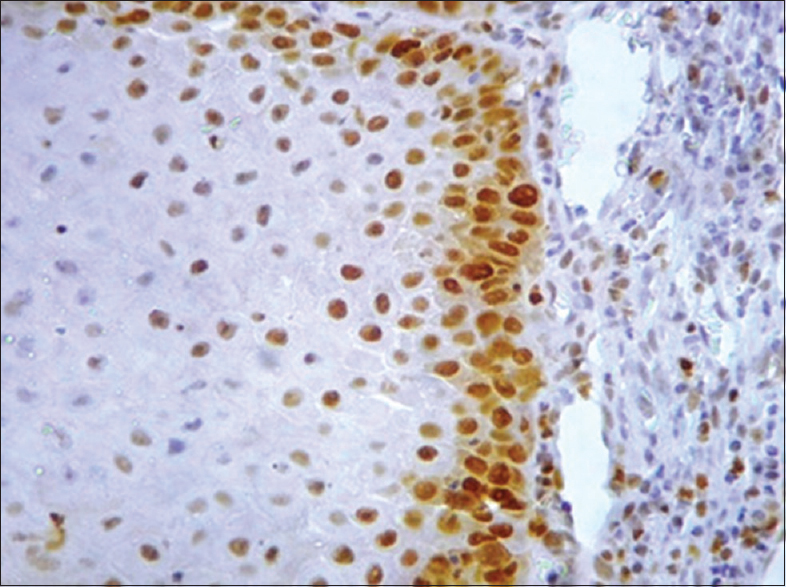 Immunohistochemical expression of PCNA, p53, bax and bcl-2 in oral lichen planus and epithelial dysplasia. J Oral Sci 2009;51:117-21. Liu SC, Klein-Szanto AJ. Markers of proliferation in normal and leukoplakic oral epithelia. Oral Oncol 2000;36:145-51. 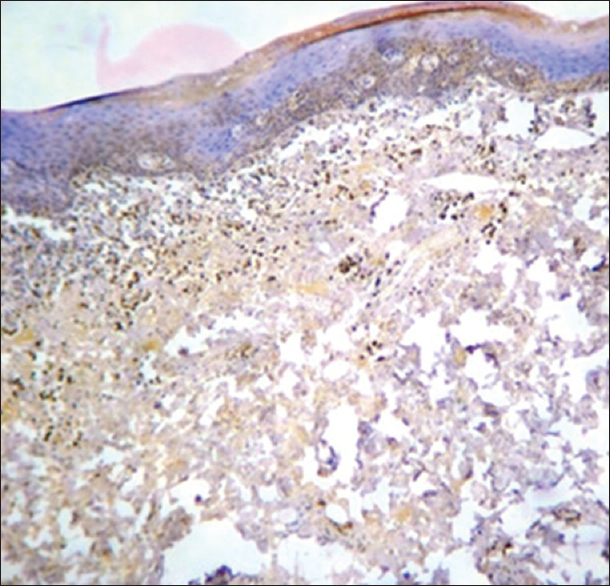 Zargaran M, Jamshidi S, Eshghyar N, Moghimbeigi A. Suitability/unsuitability of cell proliferation as an indicator of malignant potential in oral lichen planus: An immunohistochemical study. Asian Pac J Cancer Prev 2013;14:6979-83. Girod SC, Pfeiffer P, Ries J, Pape HD. Proliferative activity and loss of function of tumour suppressor genes as 'biomarkers' in diagnosis and prognosis of benign and preneoplastic oral lesions and oral squamous cell carcinoma. Br J Oral Maxillofac Surg 1998;36:252-60. Watanabe S, Watanabe R, Oton-Leite AF, Alencar Rde C, Oliveira JC, Leles CR, et al. 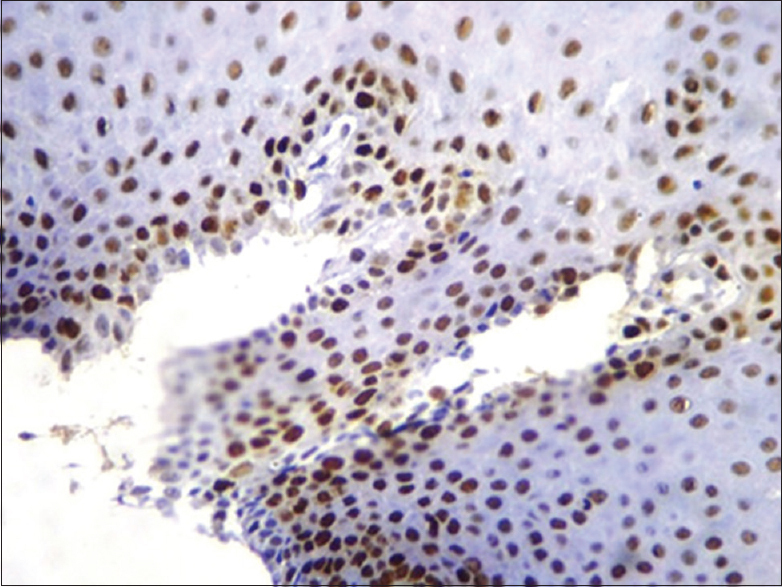 Analysis of cell proliferation and pattern of invasion in oral squamous cell carcinoma. J Oral Sci 2010;52:417-24.